The North Carolina Cooperative Extension Service, part of a national organization funded by federal, state, and local governments as well as private sources, serves as a link between university agricultural research and the people of North Carolina. The Morrill Acts, passed by Congress in 1862 and 1890, funded North Carolina's land grant colleges (modern-day North Carolina State University in Raleigh and North Carolina A&T University in Greensboro), which were founded to make education available to a greater number of North Carolinians. In the late nineteenth and early twentieth centuries, the idea of wide-ranging agricultural education continued to gain momentum. In 1914 Congress passed the Smith-Lever Act, which established the Cooperative Extension Service. The North Carolina Agricultural Extension Service was soon founded, operating in partnership with the state's land grant colleges. B. W. Kilgore served as its first director. The Extension Service county agents, home economics agents, and agents who worked with children in what came to be known as 4-H made information available to people who previously had little access to the state's institutions of higher learning. They helped meet the emergencies of two world wars, the Great Depression, and numerous agricultural and financial hard times. In 1991 the North Carolina Agricultural Extension Service became the North Carolina Cooperative Extension Service, reflecting the national organization. As American society changed, the organization came to serve more urban families than rural. Modern Extension Service agents continue to help with issues concerning agriculture, horticulture, conservation of natural resources, protection of the environment, nutrition, health, and a wide variety of family and economic concerns. They also reach out to youth, mainly through the 4-H Clubs. The mission of the Cooperative Extension Service remains helping North Carolinians improve the quality of their lives through the acquisition of knowledge. James W. Clark Jr., Clover All Over: North Carolina 4-H in Action (1984). Wayne D. Rasmussen, Taking the University to the People: Seventy-Five Years of Cooperative Extension (1989). I. O. Schaub, Agricultural Extension Work: A Brief History (1953). 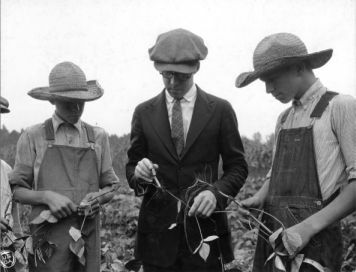 Club members Robert and Steven Sloop and leader examining nodules on mung beans in a soil improvement demonstration field, Rowan County, N.C., September 11, 1923. Courtesy of North Carolina Cooperative Extension Service, NCSU University Archives Photographs. Available from http://d.lib.ncsu.edu/collections/catalog/0013031 (accessed September 18, 2012). 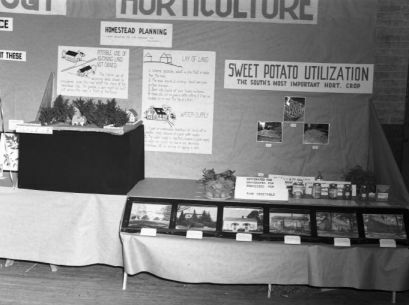 Farm and Home Week Agricultural Exhibit, ca.1947. Courtesy of North Carolina Cooperative Extension Service, NCSU University Archives Photographs. Available from http://d.lib.ncsu.edu/collections/catalog/ua023_007-007-bx0022-010-134 (accessed September 18, 2012).